When it comes to musical training, I’ve had near to none. It’s mostly my own fault. When I was in sixth grade, my classmates and I got to choose between 30-minute-a-week Flutophone lessons or 30 minutes of read-whatever-you-want in the school library. I chose the latter, and that—as the poet Robert Frost so famously said—has made all the difference. 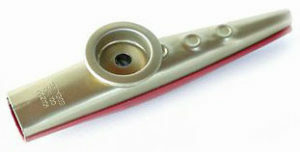 Today is National Kazoo Day. Yep, that’s a real thing. It got me to thinking about a boy I knew in high school named Billy Berenson. I’ll never forget how Billy tricked me. He brought a kazoo, which I knew nothing about, to school and could play any and everything on it. “Happy Birthday.” “The Star Spangled Banner.” “In-A-Gada-Davita.” No matter what song I named, Billy could play it. He closed his eyes and swayed his head back and forth and worked his fingers on the holes in the kazoo tube and made music that was really quite wonderful. It wasn’t until I got home and told my mother about his amazing talent that I learned that not only had Billy played the kazoo, he’d played me for a fool. And so I bought my first kazoo, the crazy little melodic instrument with the vibrating membrane that allows even those with no musical training or talent to play songs. The first time I tried it, I made the same mistake many rookies do. I blew into the tube. Nothing happened. But I quickly caught on to humming, and even singing, into the kazoo. I discovered that the finger holes are fake, another way Billy had pulled one over on me. I played the dickens out of that kazoo. And I made discoveries that should have come as no surprise, though they did. The first was that, although I was physically fit, I didn’t have the wind to play an entire song—even a short one–without stopping to take a breath. The second was that if you can’t carry a tune when you sing, you can’t carry a tune when you play the kazoo. But those revelations didn’t stop me from playing way back then and they don’t stop me from playing now. I own a dandy little red-and-gold metal Kazoo that I’ve had for years. I bought it at Cracker Barrel. The price tag on the box says $1.99. I’ve gotten a thousand times my money’s worth of pleasure out of that kazoo. I keep it in my desk drawer and sometimes pull it out when I get stuck on a writing assignment–a newspaper column, for example. I’m not sure why, but my go-to song is “When the Saints Go Marching In.” It’s enough to make you cover your ears. I only wish Billy Berenson was around to hear me play. It would serve him right.